Daystar's Body Lift Kits are more than just spacer blocks placed on top of factory mounts! Instead, these are complete replacement body mounts with an additional 1" of height, which raises the body 1". 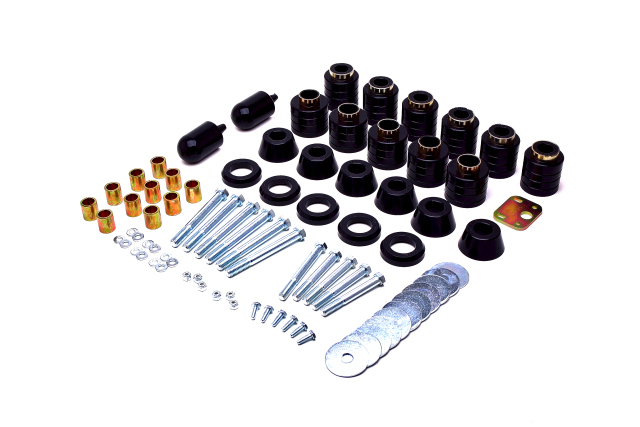 Daystar's body lift kits use a special blend of Polyurethane that is resistant to vehicle fluids and road grime while keeping the body isolated from chassis noise and vibration. These mounts keep the body properly aligned with the frame and include all the necessary hardware for installation. Daystar Body Lifts are perfect for modifications such as high-clearance skid plates (belly-up kits), engine conversions, and applications that need a little more room for larger tires and wheels. Since the body is relocated 1", no other modifications are needed to items such as fuel filler necks, wiring, and the steering sector shaft. Transfer case linkage brackets are included on some applications. Depending on vehicle age it is a good idea to inspect these and other components and replace any items that show evidence of wear or cracking. "Everything You Need To Lift the Body of Your Vehicle 1"""